If you decide to visit just one thing around Cebu, visit Tumalog falls. 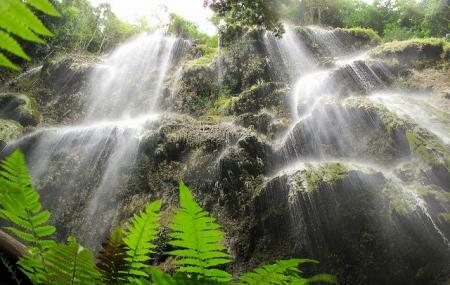 The most stunning scenes await you as you start your hike up to Cebu’s fantastical waterfalls. Not thundering or fierce, these falls are gentle and mystical. They are set amidst the most beautiful surrounding; trees that are hundreds of years old, soft rounded rocks and misty leaves. The falls are nature’s bounty and a paradise on earth. A sight not to be missed! The hike to the falls is steep and tiring. Wear comfortable shoes and carry water and refreshments. 15 minutes away by car from the Butanding Watching area. Bring your own car or rent a habal-habal to bring you there. How popular is Tumalog Falls? People normally club together Kawasan Falls and Cebu Heritage Monument while planning their visit to Tumalog Falls. The falls are absolutely amazing! When we went we didn't use the bike transfer instead just walked down the slope so as long as you have good knees it saves you 60 piso. The place was so quiet and a great place to just sit and chill and take in the natural beauty. The water is very shallow to you can walk up under the falls. This place is very beautiful and definitely a must see! Beautiful waterfall with what I would imagine to be clear blue water. We went at about 12pm and it was packed! I would advise getting there as early as possible to avoid the crowds and try to avoid weekends. Would have been well worth a visit if it weren't so crowded. Not as peaceful as we anticipated. Very beautiful waterfall and very tall. It's best to visit when it's not the dry season so that you can experience the waterfalls true beauty. Beautiful waterfall, very different from all of the others on Cebu. Very tall with the waterfall scattered over the wall. We went at 10am on a Wednesday and there were only a couple of other people there. The walk from the parking lot to the waterfall is less than 10 minutes. It is down a hill but it is completely paved and safe to walk. They try to drive you on a scooter and make you pay 50php but we didn't do this and it was fine.